Seattle and Tacoma ports combined container operations a year ago, replacing zero-sum competition with cooperation. First things first. The seaport of the Port of Seattle is now called the North Harbor. At the Port of Tacoma, it’s the South Harbor. This renaming, used by everyone from port commissioners to line employees, is more than symbolism as the Northwest Seaport Alliance marks its first year. It shows how far the two ports have come from decades of blood-sport competition to joining operations. Thus it was appropriate that the first mega-container ship to visit the Alliance, calling at the North Harbor, was named the Benjamin Franklin. While British gallows didn’t await the rival Puget Sound ports, declining market share most assuredly did, and was likely to get worse. The Alliance, agreed to in 2014, gives equal voting power to each port commission. Neither port nor county “lost,” an important element to securing cooperation. John Wolfe, the capable boss of the Port of Tacoma, was named chief executive of the Northwest Seaport Alliance. His top operations deputy, Kurt Beckett, came from the Port of Seattle. Indeed, no modern precedents exist for two large, rival ports to willingly combine container operations. The Port Authority of New York and New Jersey, dating to 1921, is the closest analogy, but the seaports weren’t equal at the time and the entity now encompasses much more than container traffic. Authorities in Georgia and Virginia were established top-down by state legislatures. John Creighton, president of the Port of Seattle Commission, said, “Going into any new venture where you had fierce competitors, we expected many more hiccups.” Yet they were few. While one snapshot does not signal a turnaround, the combined seaports saw their best month ever in June. They also performed better than California ports last year and are receiving new traffic with the end of container service to Portland. It also connects to the second-largest concentration of distribution centers along the West Coast. Bulk, breakbulk (cargo as separate pieces), project/heavy-lift cargoes and vehicles are also major operations. Sliced another way, in the Journal of Commerce’s 2015 rankings of inbound and outbound traffic, the two harbors constituted the sixth-largest container port in North America. Hanging together brings advantages beyond ending the zero-sum game of competing for container lines. For example, when the Grand Alliance and Hamburg Sud lines left Seattle for Tacoma before the Alliance was formed, it was a painful loss for Seattle. 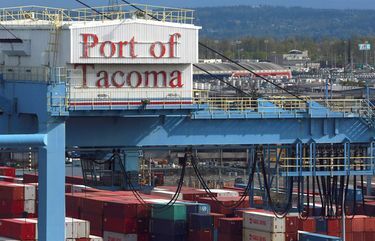 With the agreement, capacity issues in Tacoma — oops, the South Harbor — were fixed by moving some of the container vessels to terminals in the North Harbor. A new operations center keeps watch over both harbors, terminals, road and rail connections, and outreach to the large web of stakeholders. For example, if a bottleneck appears, the ops center responds. It measures efficiency and reliability. The Alliance is also better able to make strategic investments. The North Harbor has one terminal that can handle megaships. South Harbor’s Terminal 4 is undergoing $141 million in improvements, with four cranes that can handle two megaships at once. Terminal 5 in the North Harbor — scene of Shell drilling-rig protests — is being reconfigured to take two big ships simultaneously. In addition, the combination has allowed the Alliance to speak with one voice to cities and the Legislature on such issues as transportation. This was a nick-of-time coming together. The Alliance was formed before the big drop in shipping brought about by slower growth in Asia and the consolidation of shipping lines. But when a rebound comes, so will the megaships. And the Alliance intends to be ready. In addition to Vancouver, B.C., the fifth-busiest North American port, Prince Rupert boasts the shortest sailing distance from many points in Asia and a straight shot to the Midwest on the Canadian National Railway. I’ve never bought the notion that Seattle’s port is analogous to San Francisco and on the way out, while Tacoma is comparable to Oakland, as the region’s viable port. San Francisco was done in by a variety of factors, including the shift to moving seaborne cargo by containers. As long as we have the 10,000-mile supply chain, both the North and South Harbors are needed. They are the foundation of trade that supports 40 percent of the state’s family-wage jobs. And thanks to the Northwest Seaport Alliance, the region is in its best condition to compete in a long time.